I’m obsessed with the Food Network and generally inspired by Ina Garten. Ina can do no wrong. Her colorful cookbooks are full of deliciously simple recipes with great photos and easy to follow directions. 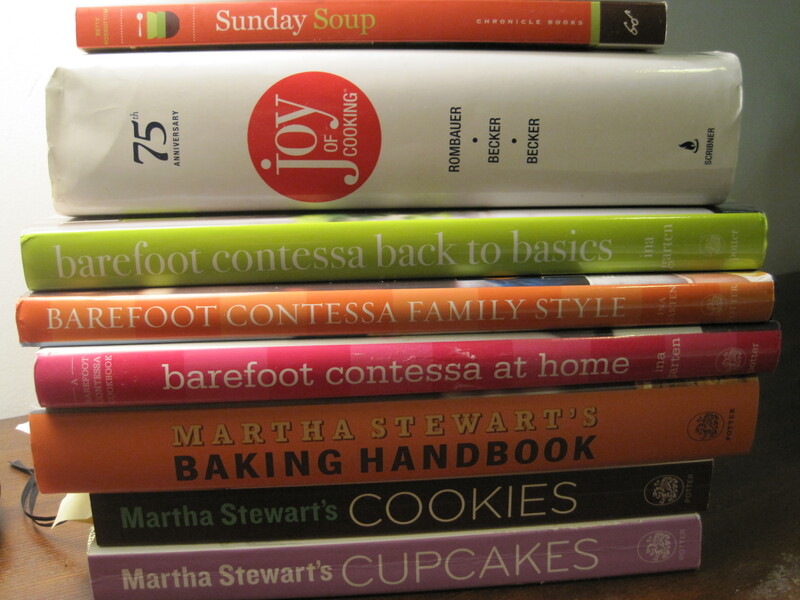 I worked for Martha Stewart at one time, so naturally I go back to her extensive library in times of need. Also, I like to make healthier dishes that won’t send you directly to an early grave so I often seek out lighter substitutes. Some of those are inspired by Weight Watchers which is a great source for healthier substitutions. Betty Rosbottom’s Sunday Soup cookbook is like a soup Bible and is broken down by seasons. Soup for every season! What more could you need? And of course, The Joy of Cooking. Everyone should have a copy. Here I’ll list where I find/modify/adapt the recipes that I use to make Good Things to Eat. I LOVE your blog about the ice cream ball! It’s absolutely great! I’ve forwarded it on to many friends in my address book. We really did have a great time — and next year we’ll stay longer!